Capture images and record videos from entire screen, webcam or any graphic element on a screen using a cross-platform Java library. Great support. Responsive support team will answer your request within 24 hours. To get help you can choose different support channels: email, support site and forum or premium support service. You are welcome to contact us with initial questions at evaluation support address. Learn more. * The example demonstrates full screen capturing. You can capture any screen activity and save the result to a movie file. The API makes it possible to specify the resulting movie format, size, bitrate and codec. Under Windows platform you can capture the definite window when it is located outside of a screen or overlapped by other windows. You can record the resulting video with sound from a microphone or other input device. JxCapture allows you to gather the specific information about the UI elements on your screen — windows‘ bounds, parent, children, and many more. You will be able to take a full screen capture on multiple monitors, capture a rectangular screen area, entire window or any UI element. You can listen to keyboard, mouse and other system events. Cross-desktop Java applications that require making window snapshots. JxCapture provides convenient cross-desktop Java API for making snapshots from a particular window on desktop, or entire desktop. Java applications that provide desktop sharing ability.Great performance of JxCapture allows using it the applications that provide live desktop broadcasting. Add-ons for issue tracking applications.Providing the ability for making static (images) and dynamic (videos) captures JxCapture is an indispensable tool for the issue tracking systems allowing users to grab and record visual contents of an application. You can ask a question on our product forum. In order to do it, you will need a Google ID. Your message will be automatically posted on the web. Does JxCapture support video streaming? No, current version of JxCapture does not support streaming. 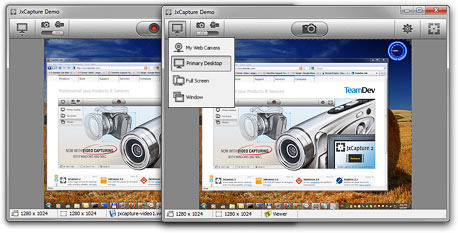 Is there desktop+webcam video capturing (mixed) mode available in JxCapture? No, there is no such more in JxCapture product yet. This is the planned feature for one of the next versions. Is it possible to capture the contents of a window that has been minimised? No, capturing the contents of a minimized window is not possible. Does JxCapture support Windows 2008 Server and Windows 2012 Server platforms? Yes, JxCapture provides the support of these platforms. However, in order to enable video capturing ability in JxCapture, you may need to enable “Media Foundation” and "Desktop Experience" features on those platforms correspondingly. Is there any utility in JxCapture so that I can capture the invisible areas of the window? In fact capturing of the scrollable window contents greatly depends on an application itself, so there is no such utility available in JxCapture. Our licensing is based on versions of JxCapture. Having purchased the license for our product you get the right to use the current major version of the product. How much does the Runtime License cost? Runtime License is provided free of charge. Major and minor version upgrades issued during your active Standard Support subscription period are free of charge. Upon expiration of the Standard Support subscription you can renew it with a 25% discount from the actual license price. What are the terms for using JxCapture? Please take a look at the Product License Agreement. There are 6 people on our team, and 2 of them need to use JxCapture. How many licenses do we need to purchase? If we take a developer, working with JxCapture, off the project, can we reassign the license to another developer? How many copies of my product can I distribute with JxCapture included? We have 5 people, who work with JxCapture on one product. How is a Project License bound to my project? When we say “project” we have in mind one product of your company including your future product versions or potential derivative works based on your product. The best solution would be to purchase the Company–wide License, which covers any number developers and projects in one company. Upon the license purchase you will receive a license archive with two types of JAR files: development.jar and runtime.jar. Development.jar is intended to be used in the development process. Runtime.jar is to be used for distribution of your software with JxCapture enclosed. We need to look at the Source Code of JxCapture, do you provide it? Yes, you can purchase JxCapture Source Code License; it is provided on a per developer basis. Please contact our sales team if you are interested in this option. If the message gets lost in your mailbox, try searching for an email from JxCapture Evaluation Support with “Your Free 30 Days Trial” subject. Use the Programmer’s Guide to get JxCapture up and running in no time. See Support Documentation for more information on using JxCapture. Check out the ready-made examples for instructions and ideas on what you can do with your newly gotten JxCapture. b) “Runtime” means the files that are included into the Software and are required for distribution of the programs that you create using the Software. Runtime files are identified in the documentation accompanying the Software or on-line documentation (“Documentation”). You should refer to the Documentation, including any “readme” or “runtime” files provided with the Software, for additional information regarding redistributable files. c) “Evaluation License Key” means a file that allows using the Software for evaluation purposes for a limited period of time which shall commence on the day of Evaluation License acquisition, and terminate pursuant to the provisions defined by the section 3 “Evaluation License Grant” of this Agreement. d) “Development License Key” means a file that allows you to integrate the Software into programs that you create. e) “Runtime License Key” means a file that is required for distribution of your works that enclose the Software. f) “Effective Date of the Agreement” means the date when you receive Evaluation License Key or Development License Key, whatever comes first. g) “Minor Version(s)” means version of the Software, identified by a change in the second and/or any of the following levels of the versioning number sequence, ex. : 1.0.5, 1.2.1, 1.2.2, etc. h) “Open-Source Component(s)” for the purposes of this Agreement shall mean any software, whose source code is publicly available for use, modification and distribution. 4.1. Subject to the payment of the applicable license fees and to the terms and conditions of this Agreement, TeamDev hereby grants to you a non-exclusive, non-transferable license to (i) use the version of the Software and Documentation recorded in the Development and Runtime License Keys, including the Minor Version updates (ii) to reproduce and distribute the Runtime files in executable form and with Runtime License Key as part of the programs that you create using the Software without additional distribution fees (“Development License”). Development License is provided to you pursuant to the use conditions of one or several of the license types described in sections 4.2.–4.5. below. The type of the Development License governing your use of the Software is recorded in the Development License Key, provided to you upon the license purchase. 4.2. Per Developer License may be used by the developers, employees or contractors under your control. The number of software developers, employees or contractors using the Software in each case should be equal to the number of Development Licenses acquired from TeamDev. Your name or the entity’s name and the number of Development Licenses acquired are recorded in the Development and Runtime License Keys. 4.4. Company–wide License may be used in any number of your projects by any number of developers, employees or contractors under your control. 4.5. Personal License allows just one person to exercise the Development License rights. The name of the person, to whom the license is granted, is recorded in the Development and Runtime License Keys. 5.1. General License Restrictions. You may NOT: a) modify, adapt, alter, translate, decompile, reverse engineer, or disassemble the Software; except as may be required to replace a third party Open-Source Component that is used in the Software; b) remove any proprietary notices or labels on the Software; c) make more copies of the Software than the number of the acquired licenses (excluding a copy for backup purposes); d) rent, lease, or otherwise transfer rights to the Software. 5.3. Development and Runtime License Restrictions. In addition to the general restrictions denoted in the section 5.1., as the holder of the Development and Runtime License you may NOT: a) use Development License Key for redistributing Runtime files as part of your applications; b) use Runtime License Key for development purposes. 5.4. As a holder of a Per Developer License you may not duplicate and provide the Development License Keys to a number of software developers, employees or contractors greater than the number of Development Licenses granted per section 4 of this Agreement. 5.5. As a holder of a Project License bundle, you may not use the license for more than one project. At the time of license issue it is bound to one project, and you may not use the license for projects, to which the license was not initially bound. 5.6. As a holder of a Personal License you may not transfer the Development License to anyone. You agree to be identified as a customer of TeamDev and you agree that TeamDev may refer to you by name, trade name and trademark, if applicable, and may briefly describe your business in TeamDev's marketing materials and web sites. You hereby grant TeamDev a license to use your name and any of your trade names and trademarks solely in connection with the rights granted to TeamDev pursuant to this marketing section. iii. 1 business day response time. 7.3. TeamDev agrees to provide you with free Standard Support in an amount of hours defined per the section 7.4 of this Agreement, valid for one year since the date of the license purchase. 7.4. The number of Standard Support hours is defined by the type of Development License, described in section 4 of this Agreement, on per-product basis. This information is available on Software product pages on TeamDev official website (teamdev.com). The number of hours designated for each product is a subject to change without prior notice from TeamDev. In case of such change any number of hours already granted to you pursuant to a license purchase will remain valid for you. 7.5. Upon expiration of one year’s period after a license purchase or consumption of the allocated hours of Standard Support per section 7.4., you may choose to purchase additional Standard Support service. 7.6. In the course of Standard Support TeamDev may provide you with supplemental software code or related materials, that are made available in form of Software updates (including hotfixes). Such supplemental software code or related materials are to be considered part of the Software and are subject to the terms and conditions of this Agreement. 7.7. With respect to any technical information that you provide to TeamDev in order to enable TeamDev complete your requests for Standard Support, TeamDev may use such information for its business purposes without restriction, including for product support and development. TeamDev will not use such technical information in a form that personally identifies you. 10.2. TeamDev and the Software are in full compliance with any Open-Source Components’ licenses to grant the licenсe rights granted herein. 10.3. The terms and conditions governing the use of such Open-Source Components are in the Open-Source Software Licenses of the copyright owners and not this Agreement. This Agreement does not grant any rights to use the trademarks or trade names: “TeamDev”, “JxBrowser”, “JExplorer”, “JNIWrapper”, “ComfyJ”, “JExcel”, “JxFileWatcher”, “JxCapture”, “DotNetBrowser”, “JxMaps”, or any other trademarks, service marks, logos or trade names belonging to TeamDev except as defined in the Section 6 “Marketing”. You agree not to use any marks belonging to TeamDev in or as part of the name of products based on the Software.